The forecast today was for West winds, building to 25 knots or more by mid-day. And unfortunately, it was once again correct. Here, a West wind would be preferable to a North or East wind, since it would be a following wind and the shore would offer some protection. But 25+ knots of wind in the open ocean is still not pleasant. 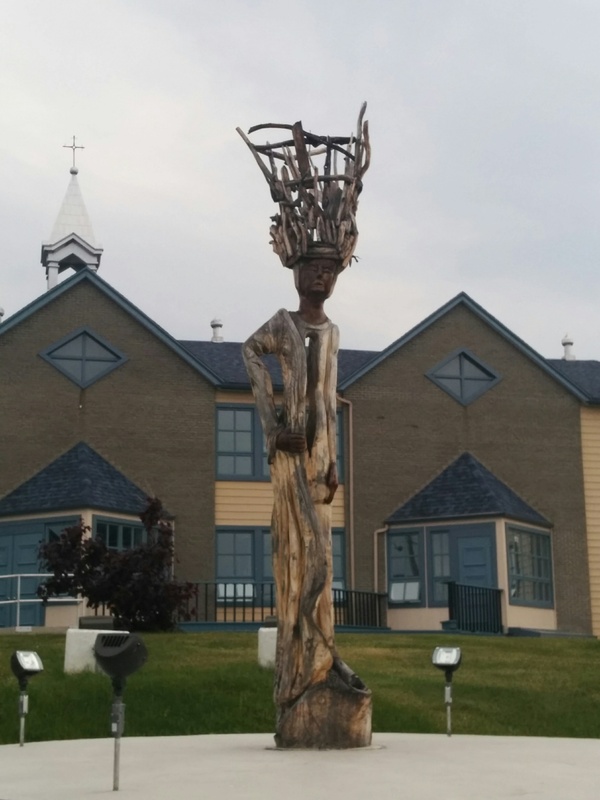 We thought about leaving early, in hopes of making the next port before the winds kicked up, but staying in Rivière-la-Madeleine was the right decision. The boat could certainly have made the transit, and the crew would have arrived intact, but it would not have been an enjoyable ride. As we keep hearing, we’re ahead of schedule, so another day in a sheltered port is better than taking a beating for four to eight hours. We’ve had some great questions posted in the comments, keep them coming and I’ll try to answer when we have internet access. I’ve covered some of the navigation gear we carry, and mentioned our electric appliances and how we power them. 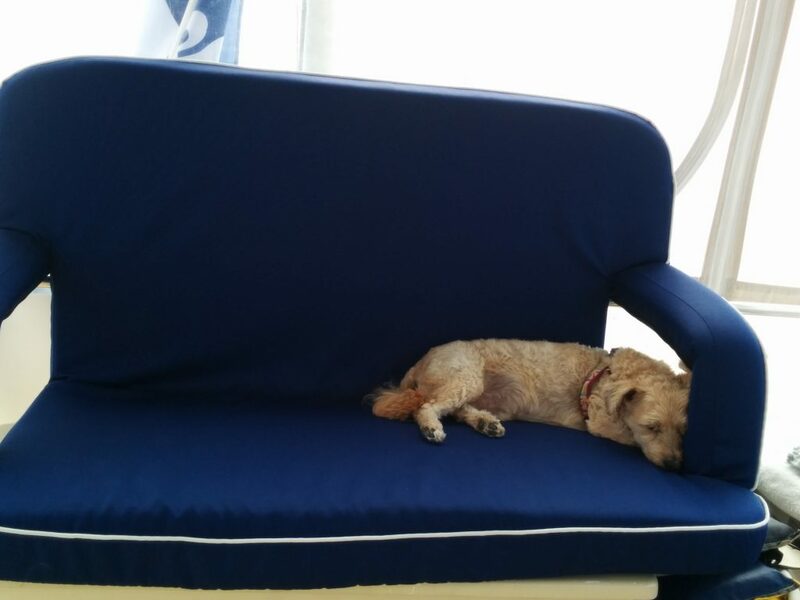 Today we’re glad to have heat on board, too. It was in the low 50’s (F) last night, and only 61 on deck in the sun now, with the wind howling. When in port, the simplest thing to use are our 2 zones of reverse-cycle air conditioning, which are similar to what some companies are marketing as “geothermal” heating units for homes. Technically, however, those units are ground-source heat pumps. Real geothermal is something a little different. Ground-source heat pumps are like air conditioners, only backwards. They pump heat from the (relatively) warmer ground by running water pipes through it. Here we don’t need the pipes, we run the ocean water directly through the air conditioner, in “reverse cycle” mode to pump heat into the boat, instead of out. Each zone takes about 8 Amps of power to run, and we’re finding that here in these out-ports, power isn’t very reliable. If we try to pull just 10 A, the voltage drops to below 100 V. So we can run one heating unit, but only if we run nothing else. Living on a boat this size means being much more in-tune with your energy budget. Our power panel allows us to manage the power sources; two 12VDC (house battery bank and backup bank) and three 120VAC (two shore power inlets and the generator). We can distribute the power among the various 12VDC and 120VAC loads. 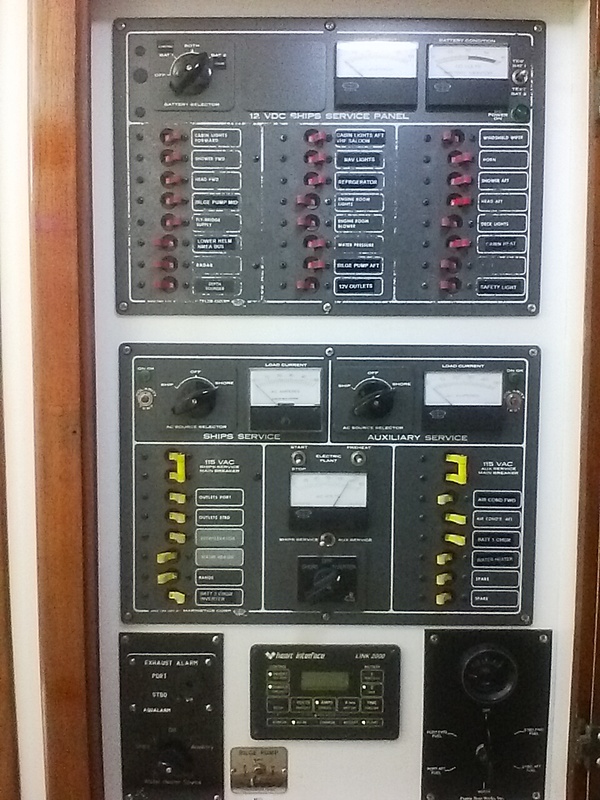 There are also some meters on the panel to show basic information about the amount of power we’re using. The second option for heat is a diesel heater, commonly used in over-the-road trucks in Europe and Russia, where they’re sometimes called “parking heaters”. Ours is a Russian brand called “Planar.” It’s basically a very small forced-hot-air furnace that runs on diesel fuel. Which is essentially the same thing as home heating oil. This works great, and doesn’t require shore or generator power. I try to avoid using it while sleeping, since you can never be 100% certain that no exhaust fumes can leak into the cabin, but so far it’s performed well the few times we’ve needed it. All the guide books say to avoid being out on this part of the Gulf of St. Lawrence in an Easterly wind. 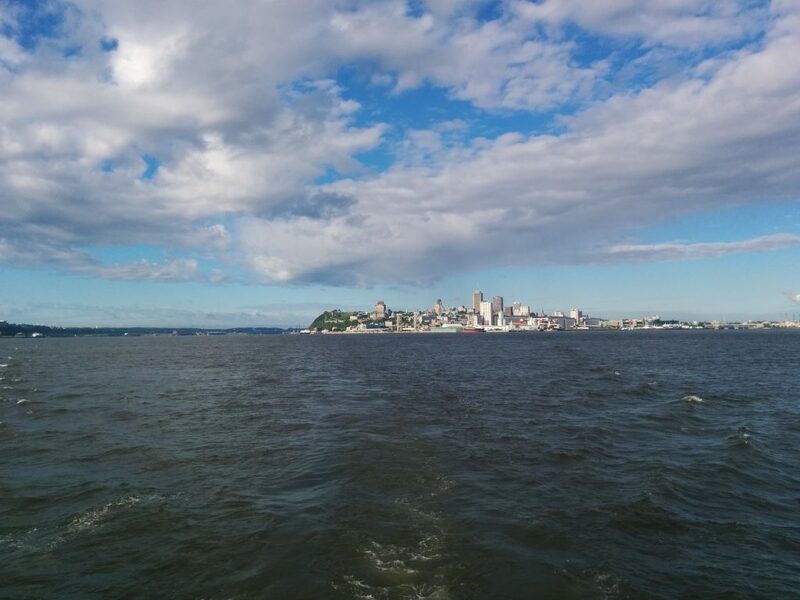 Today’s forecast was for Easterly winds with gusts up to 25 knots. For a change, the forecast seems to be correct. One other boat that was here last night headed out for another port just 17 miles away. But this port has good docks, electric hookups, and (most of the time) WiFi. We’re staying. A couple of times I’ve posted pictures of the screen of our main GPS chartplotter, and thought maybe this was a good time to explain the navigation equipment on Cygnus. First and foremost, we have a full set of up-to-date paper charts of the areas we plan to cover, along with basic navigation tools like compasses, dividers, parallel rulers, pencils and lots of erasers. All of this is backed up with a variety of electonic tools. 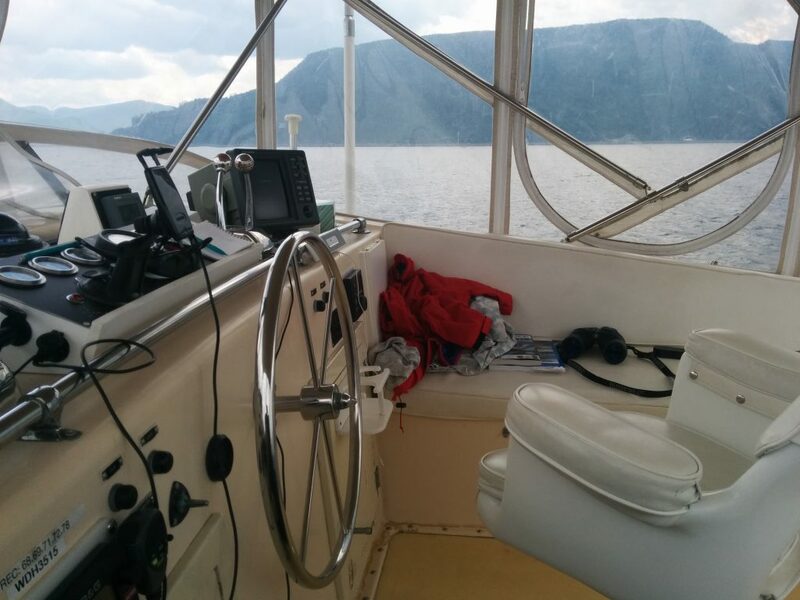 The boat came with a full electronics suite installed in 2000, including a Furuno CRT radar and Navman GPS chartplotter. These old workhorses still do the job, and are used regularly. The radar can be manually tuned when we want to highlight the shoreline, other boats, or rain sqalls. The Navman chartplotter offers a second chart display we can zoom out for a “big picture” view, and has a handy trip odometer feature that’s right on the main display all the time. 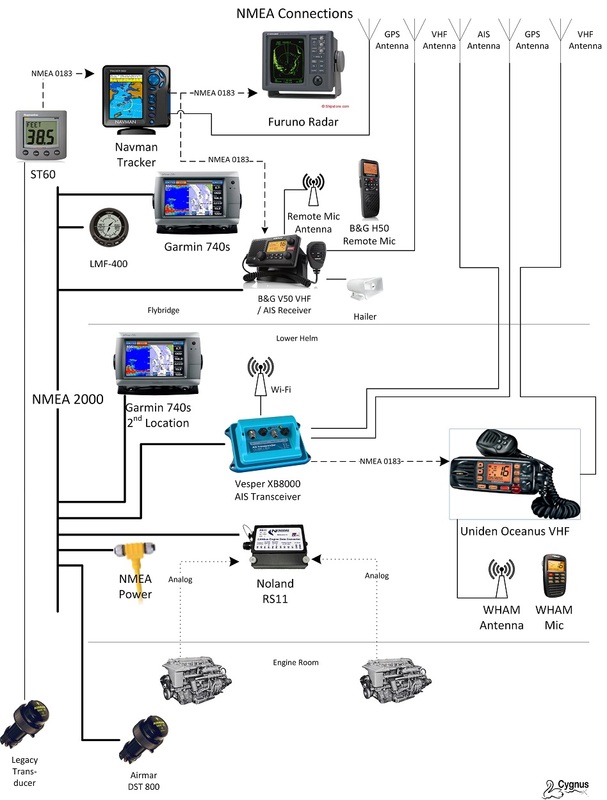 These communicate with each other, and an older depth sounder and VHF radio, using a protocol called NMEA 0183. Starting at the top row, our speed was 10.4 knots (we were going about 7-8 knots through the water, so we had about a 2-knot assist from the current.) We were on a pre-planned route, shown by the wide magenta line on the chart. 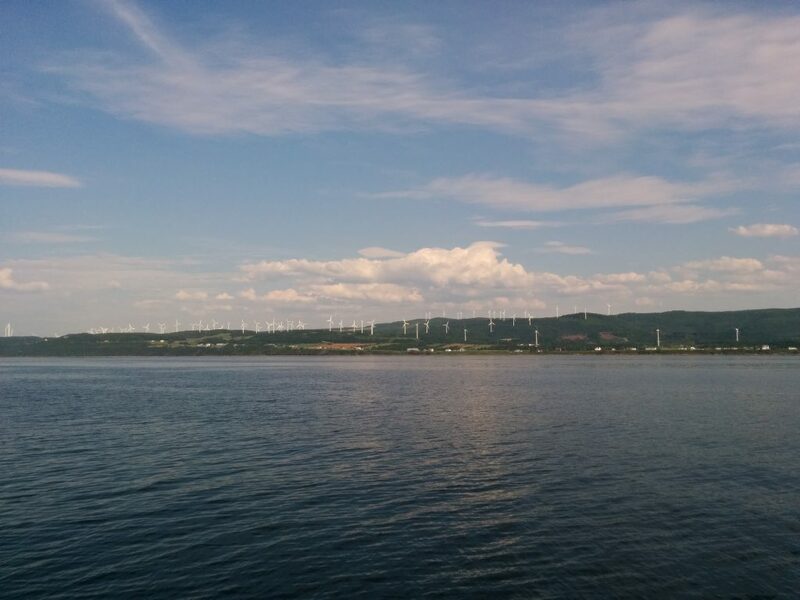 The final destination for this route (the tip of the Gaspe peninsula) was 75.5 miles away. At the current speed we’d arrive there at 21:49 (9:49 PM). We were off course by 2.3 feet with a bearing of 107 degrees magnetic to our next waypoint. Our current compass course was 103 degrees magnetic. On the next line, this photo was snapped 448 feet before our next waypoint (GASMAD, the Northmost point of the trip), which we’d reach in 25 seconds. Our velocity made good to this point was a consistent 10.4 knots. Our next turn would be 14 degrees to starboard. The time was 14:36 (2:36 PM) and the current rudder position was 3 degrees to port. Both engines were running at 1200 RPM, the depth was 202.9 feet and the latitude and logitude were shown at the lower right. This is only part of what we can display. 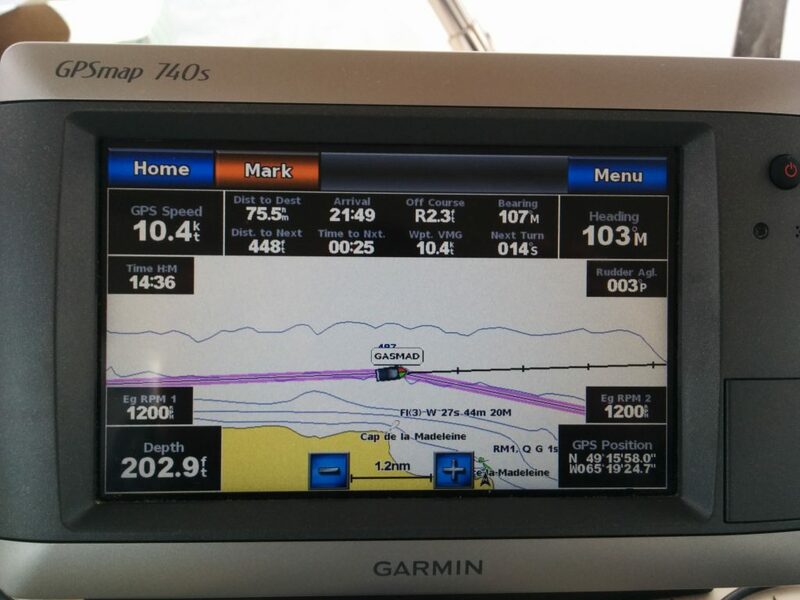 There are “dashboard” gauges for all the engine parameters, environmental readings, lists of nearby vessels transmitting an AIS signal, route and waypoint lists, radar overlay options, and different types of charts, including a perspective view and “fish eye” view. The chart can be zoomed in and out for more or less detail. We’re also running a Go-Pro knock-off camera on the bow that takes a snapshot every 30 seconds. Theoretically, we can stich these into a time-lapse video of the trip. Most of which would be pretty boring, but I’m sure with good post-production we could make some interesting clips. I haven’t found a good program to do this yet, however. The Go-Pro Studio software doesn’t seem to like my laptop, and Microsoft Movie Maker dies with an out-of-memory error every time it tries to stitch together the frames. Suggestions welcome. We have two Down East Loop guide books, one of which is pretty dated, along with ActiveCaptain data, which contains crowd-sourced reviews of all the ports, marinas and achorages. The ActiveCaptain data is loaded onto one of the two cell phone apps we use which support Canadian charts, and another that covers only the US. The phone also has a compass app, and can tap into the NMEA 2000 network using a WiFi connection to the Vesper AIS transceiver to display other vessels in the area. In a pinch, we could navigate using just the phone. The problem with both the printed and electronic guides is that there just aren’t many people who travel this coast. We’ve only run into a few other boaters traveling the same way, all sail boats. Bear Keeper is travelling from Pennsylvania to Maine, with plans to continue on to the Bahamas in the fall. 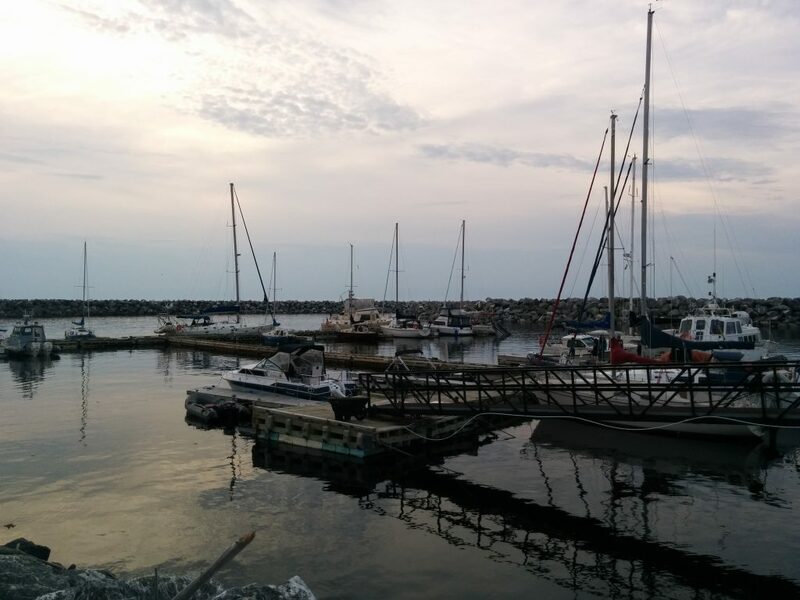 Nord Sud and Blanchons.qc.ca are sail traning boats, one traveling to Gaspe and the other turning back toward Rimouski tonight. 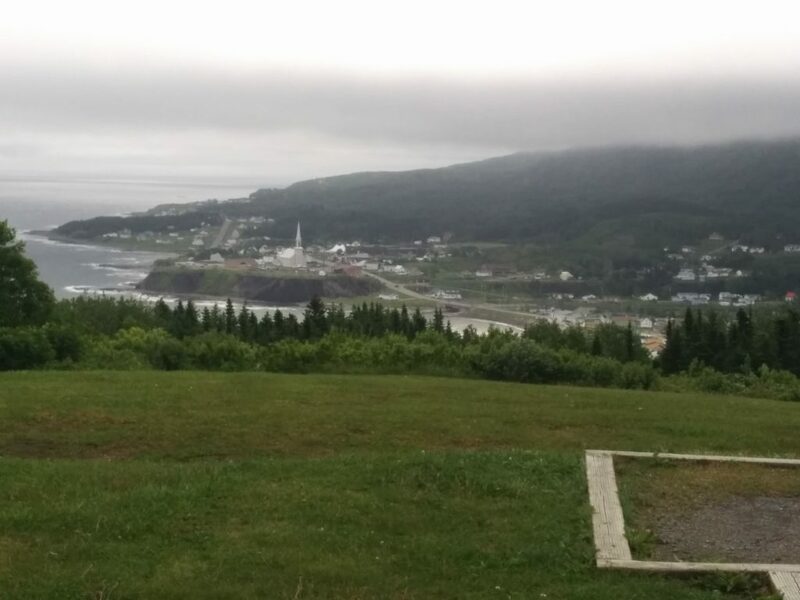 Caribou is crewed by a young Quebec couple on vacation, also to Gaspe town. Great folks, but no other loopers. The American Great Loop Cruisers Association has a lot of members, many of whom we saw going up the Hudson toward the Erie Canal, flying their AGLCA burgees. There are three burgees, depending on whether the boat has not yet done the Great Loop, or only once, or multiple times. Down East Loopers don’t have a burgee. We need one. I’m announcing the start of a burgee design contest. Send in your best designs! We got up early to leave, but waited out strong morning winds, getting underway around 9:30. The weather forecast for the next few days is questionable, but with so few ports along this coast, getting at least one more day of traveling behind us was our preference. The weather mostly held, with just some occasional rough patches and rain. This is by some accounts the Northern tip of the Appalachian Mountain chain (others say it continues to Newfoundland) and it shows. It’s amazing to see mountains plunge down to the water. Cell-phone photos can’t show the true size of it all, or the delicate play of light and dark on the hills. Two different times, we saw minke whales surface. 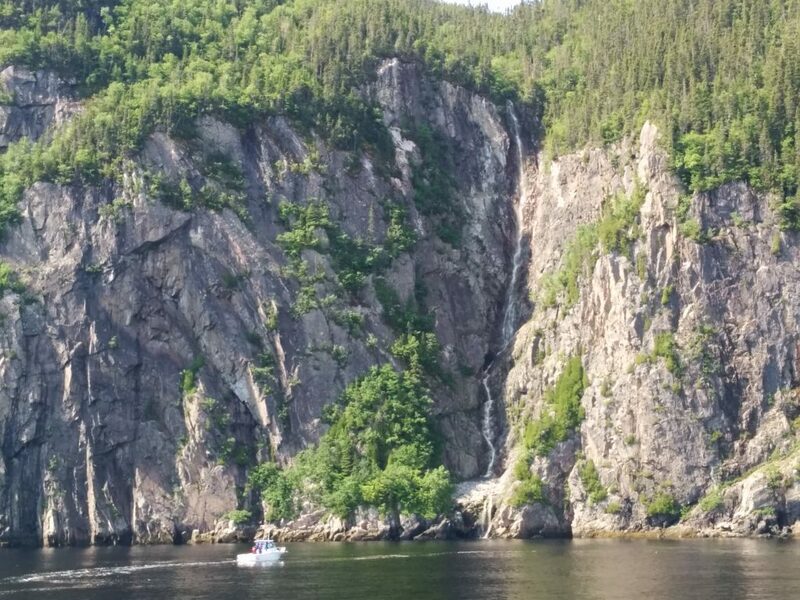 We also saw quite a few waterfalls spilling down off the cliffs. To get some sense of scale, there’s a highway on shore, near the level of the water. You can just make out telephone poles in this photo. The cars and trucks are too small to see. There are a few long valleys that reach to the water. They offer a spectacular glimpse inland, but also allow the katabatic winds to blow all night, sometimes up to 50 knots. After a warm day, the cool mountain air spills down these valleys and can be a problem for boaters. At exactly 12:15:40 PM, we reached the half-way point, by number of miles traveled along our planned route. We’ve gotten a lot of comments about how far ahead of schedule we are. But frankly, there haven’t been many places to stop for long. In the built-up areas, marinas can be expensive, and in the out-ports there isn’t much to see or do. We’re looking forward to being able to mix up marina nights with anchoring out as we get into less forbidding terrain. We expect to have more options for both as we turn South. We’re also looking forward to being able to communicate with the locals. At 2:36 PM, we passed another milestone, the Northernmost point of the trip, 49 degrees, 15 minutes, 58 seconds North latitude. This is the view of Cap-de-la-Madeleine light (shown on the chart plotter screen below). Shortly after this, we turned toward the harbor at Rivière-la-Madeleine, where two locals who spoke no English met us at the dock to point out a good place to tie up. There’s a restaurant here, and the port has clothes washers and dryers, so our evening plans are set. We’ve even got a tolerable internet connection here, so we’ll be watching the weather forecast to help decide when to make the push for the last stop before turning South. Today was a day of catching up on some rest, shopping, cleaning, and boat maintenance. There are a number of stores, including a Metro supermarket, within a short walk of the marina. The weather forecast for tomorrow is iffy. 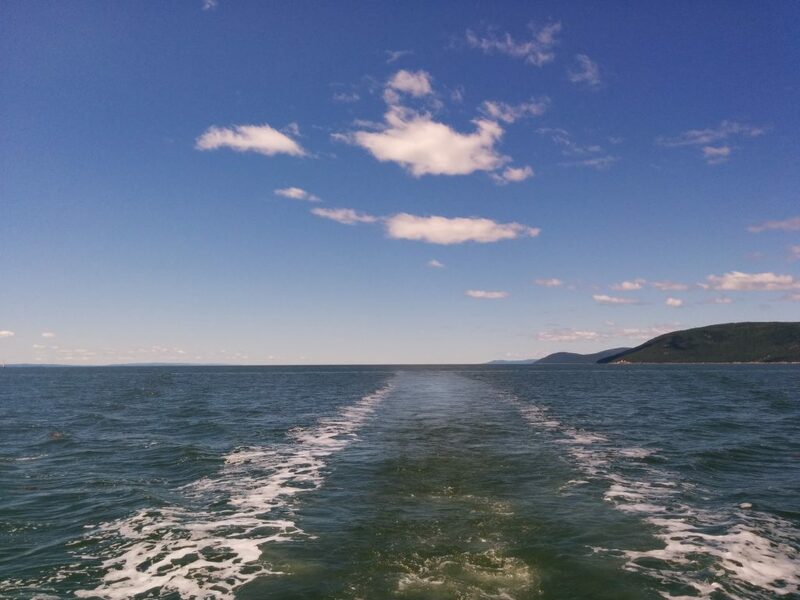 We’d like to press farther along the Gaspé if possible. 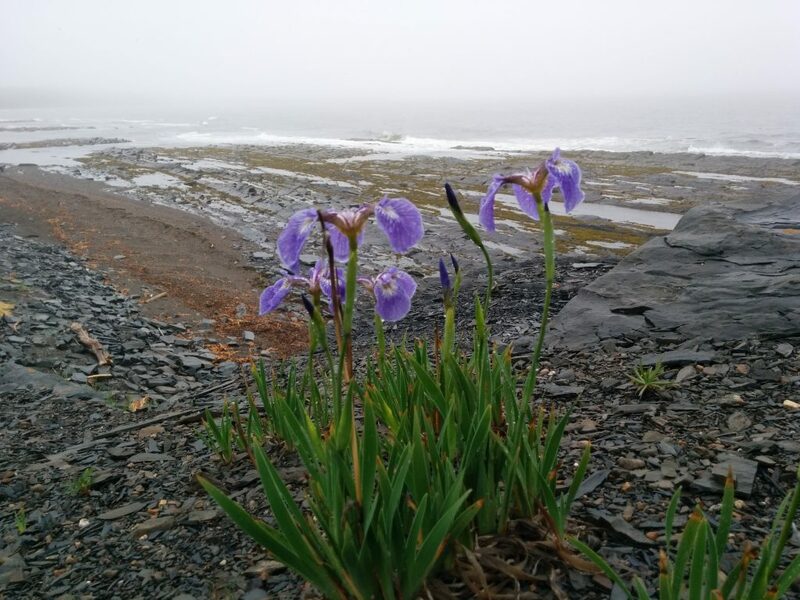 As beautiful as the scenery is here, we’re looking forward to turning South toward New Brunswick. It looks like we’re going to find more anchorages there, and shorter distances between viable ports to stop at. It will also be nice to communicate with the locals again. 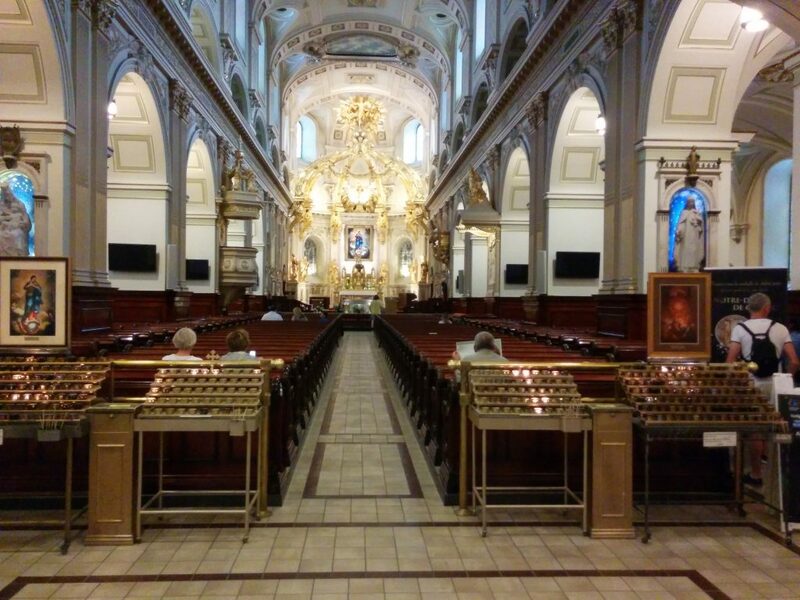 Not speaking French leaves us somewhat isolated here in Quebec. Somewhere between Matane and Cap-Chat, we passed the milestone of 1,000 nautical miles under our keel since leaving. Although the most direct route is less than 2,000 miles, we’re not quite at the half-way point yet, since we don’t always travel the most direct route. Although the scenery is spectacular, it can get monotonous, hour after hour seeing no other boats, no buoys, just open water on one side and small towns passing by on the other. 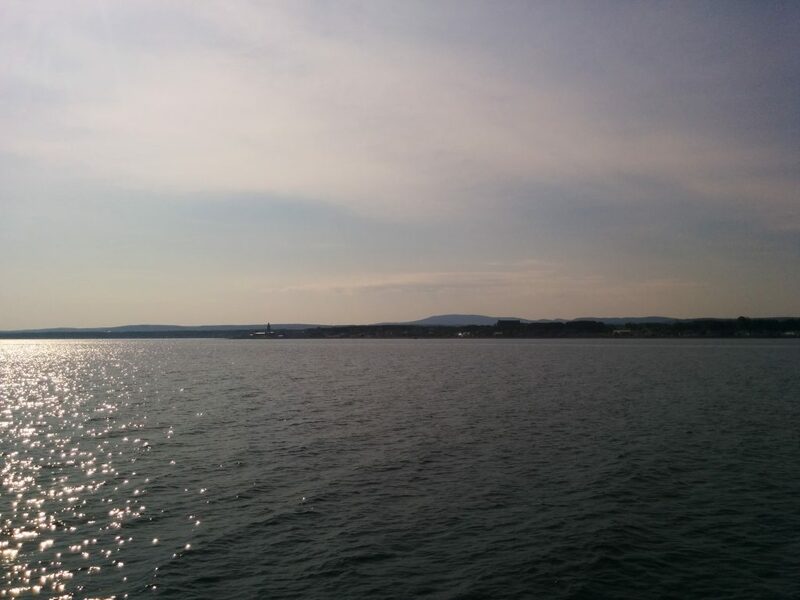 Today we had fantastic weather and decided to press hard to reach Sainte-Anne-Des-Monts, which has a little more to offer than some of the smaller out-ports. Based on the weather forecast, we may choose to hole up here for a couple of days. Monotonous as it may be, travelling in settled weather is far preferable to fighting the elements. We’re back in salt water now, and the tidal currents are lessening as the river widens to an inland sea and the tide range returns to a normal (for us) 10-12 feet. It feels odd not to be dodging lobster buoys. 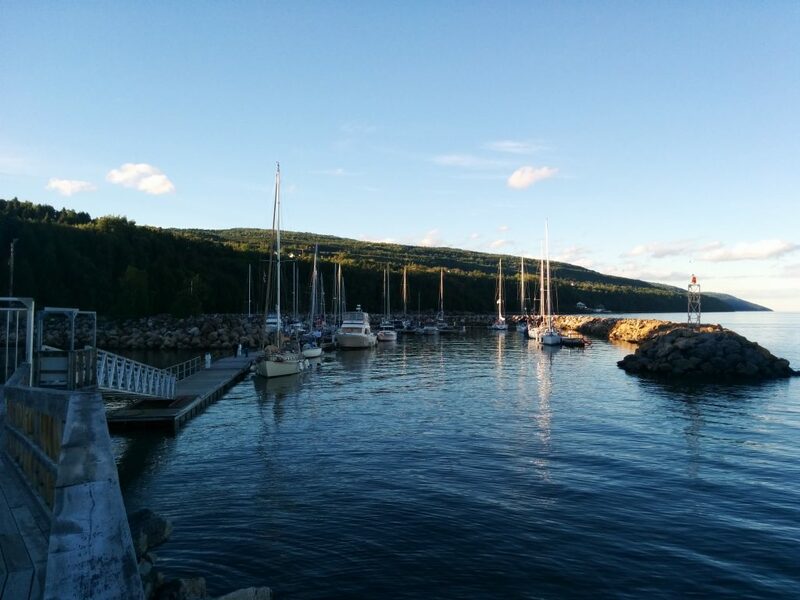 This was a welcome sight, as Sainte-Anne-Des-Monts marina is just 6 nautical miles from Cap-Chat. After fighting a 30-knot plus wind while docking yesterday, it was a joy to tie up in a flat calm. 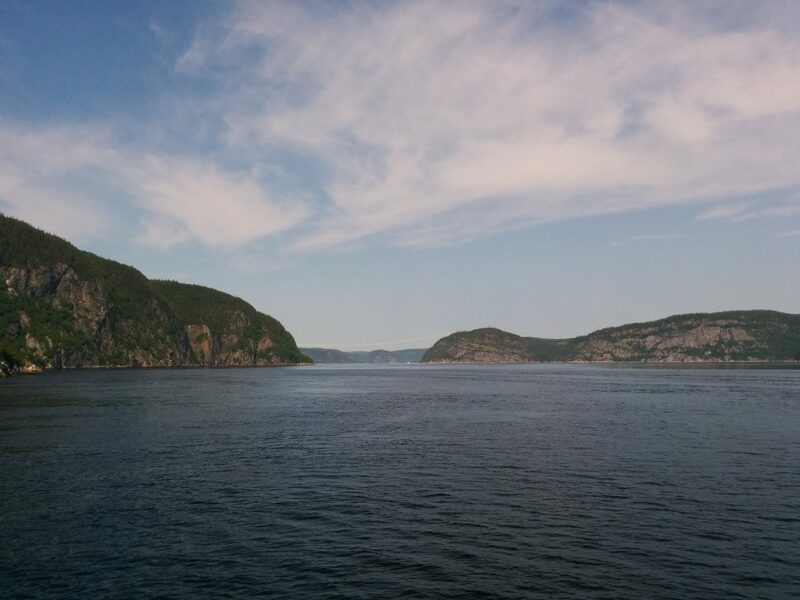 We started the day with a brief trip part-way up the fjord which is the Saguenay River. 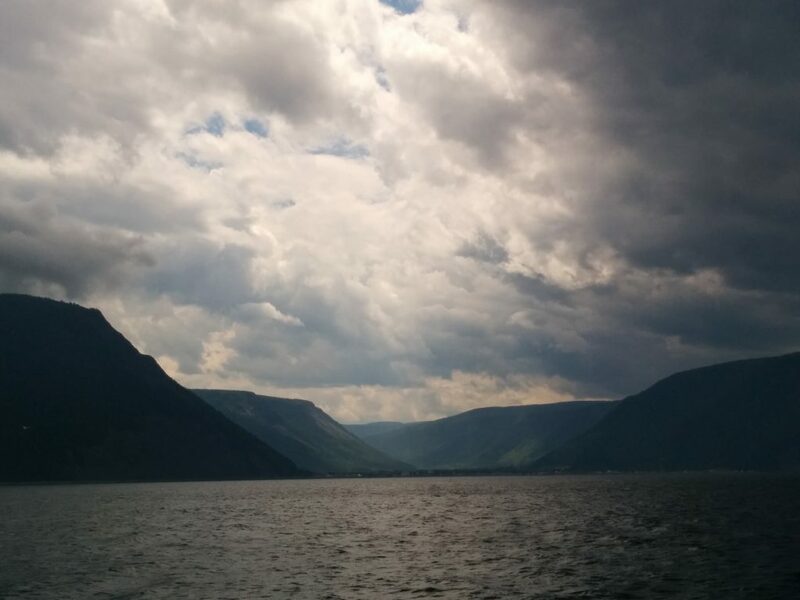 I mis-spoke in yesterday’s post, the fjord is well over 700 feet deep in places, not 400. In one spot we passed a waterfall cascading down a cleft in the rock walls. Note the boat on the lower-left for scale. 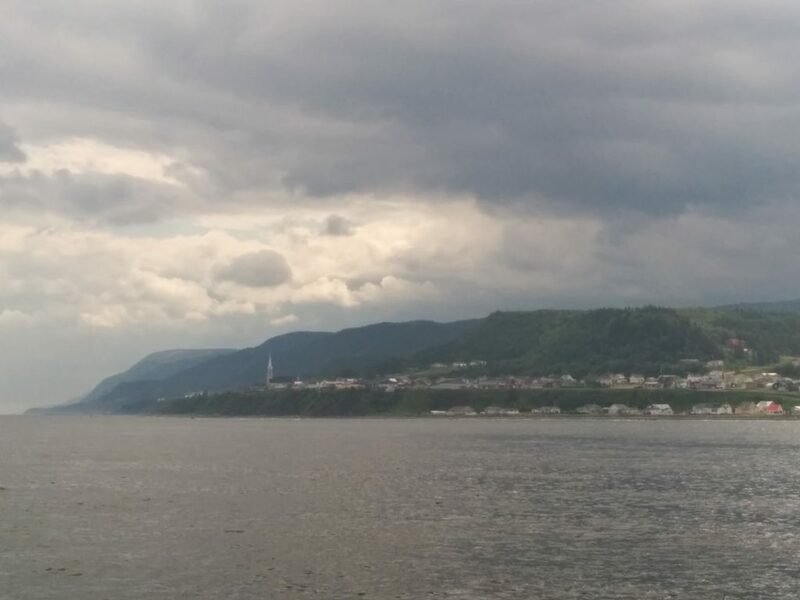 From Tadoussac we turned Northeast across the St. Lawrence and plugged in a waypoint for Ramouski, on the Gaspé Peninsula, 51 miles away. 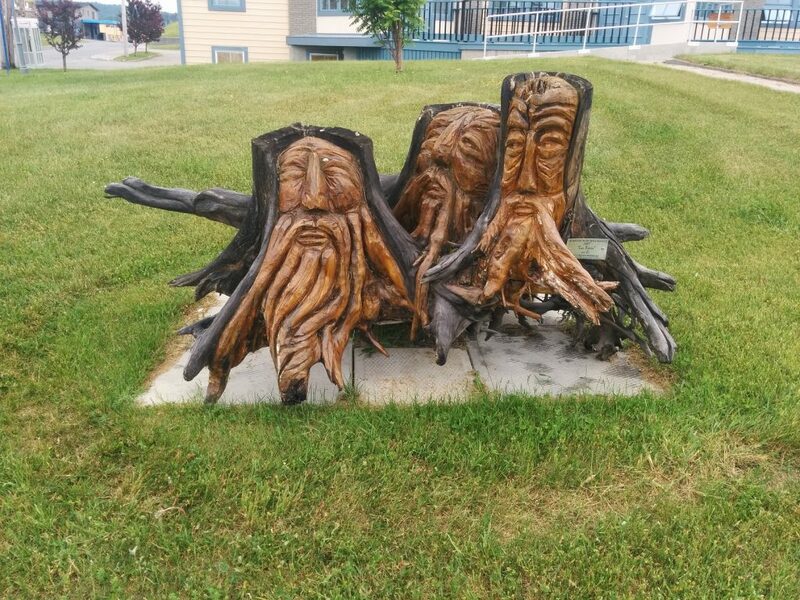 The Gaspé Peninsula is part of the Appalachian mountain chain, jutting out into the Gulf of St. Lawrence. This stretch of the trip is pretty remote, with fishing villages about a day’s travel apart. 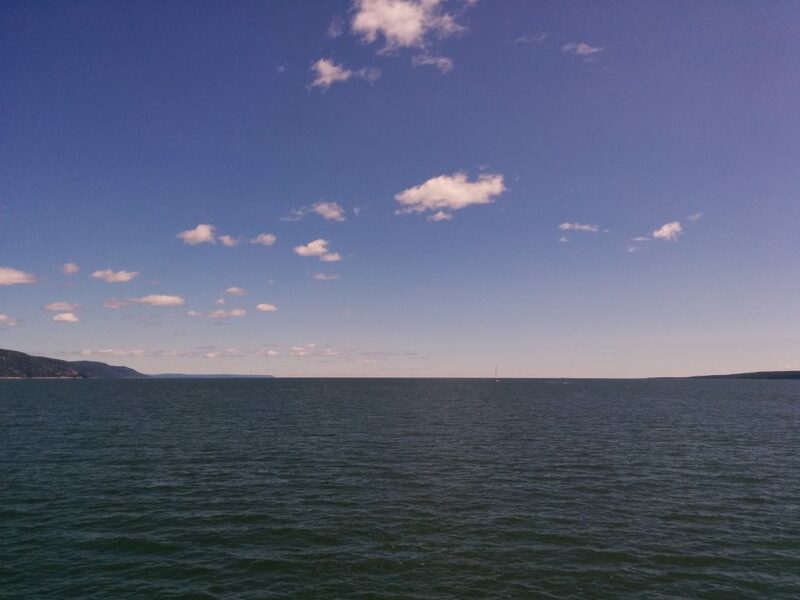 Crossing the St. Lawrence at this point is like crossing a small ocean. In spots it’s over 1,000 feet deep. We saw a number of beluga whales near the start of our trip, but the rest was pretty uneventful, if a bit bumpy at times. 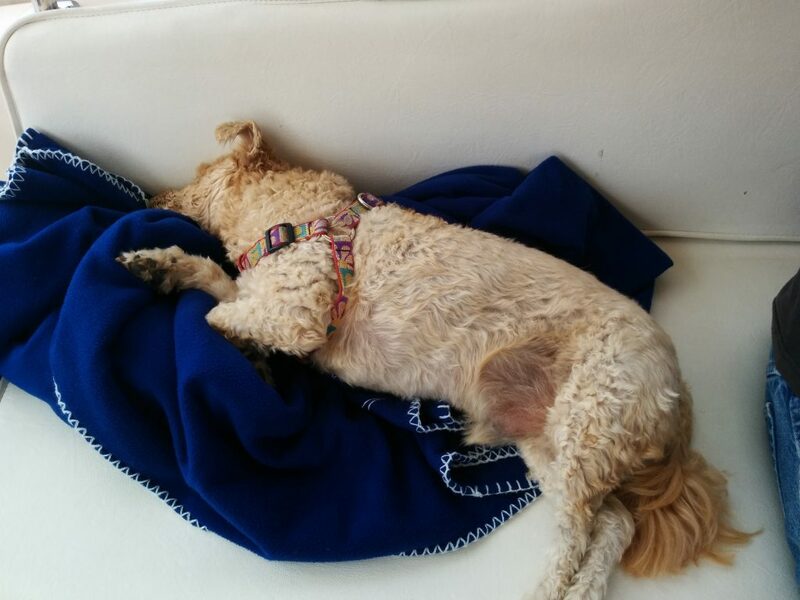 With a quartering sea, Otto got a real workout at the helm while we kicked back and maintained the watch. 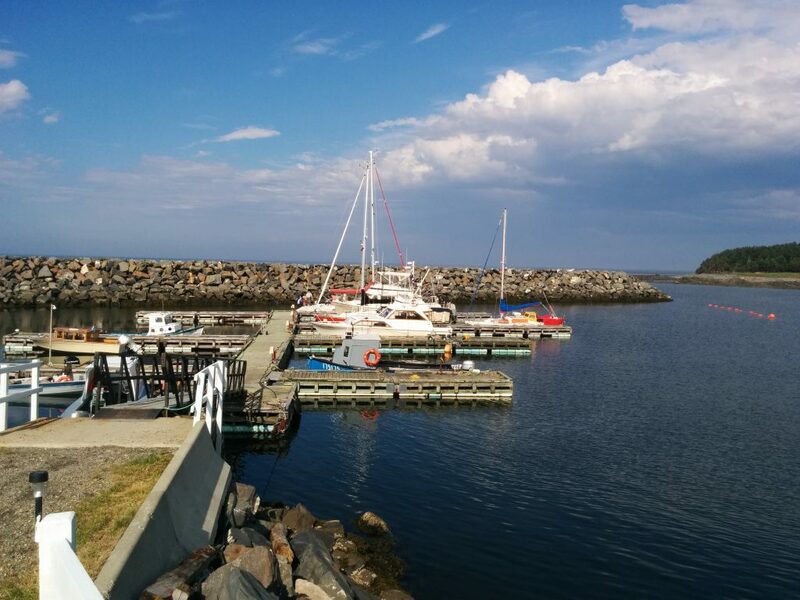 Rimouski is one of the larger towns on the Gaspé, and many boaters provision here. At this point we’re just planning to stay the night and move along tomorrow. 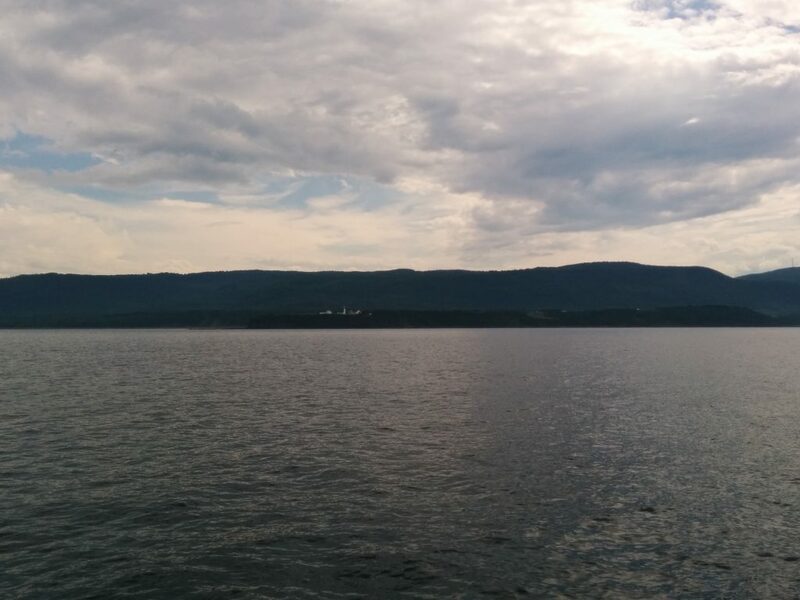 Today’s transit was from Cap-à-l’Aigle to Tadoussac, about 38 nautical miles. With the current in our favor, running the engines barely above idle, we made it in less than 3-1/2 hours. The two sailboats that have been following the same route were amazed to see their speeds above 11 knots in places. Although swift, the river is deceptively wide, about 10 miles along this section. It distorts all sense of distance, and it can feel like you’re standing still, even while being whisked along. The weather today was perfect. Blue sky, puffy white clouds, and a light following wind. 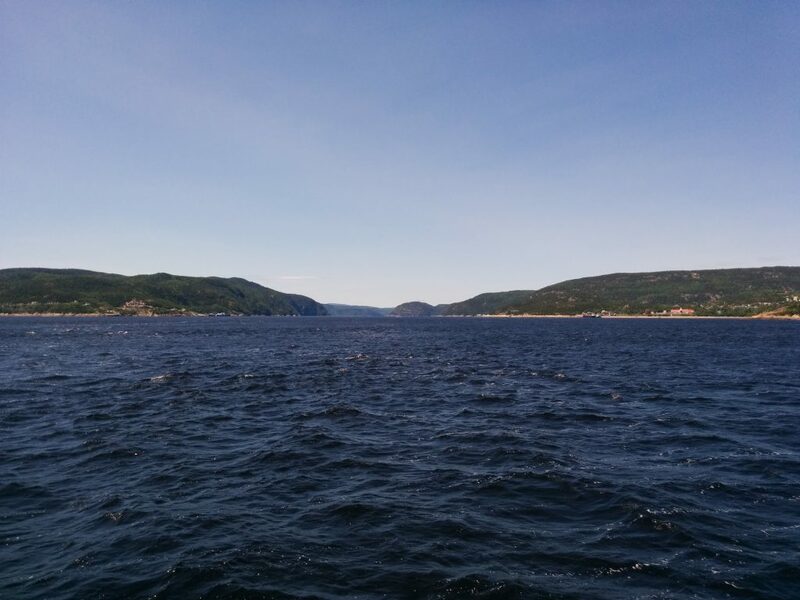 As forecast, the wind did pick up as we approached Tadoussac, at the entrance to the Saguenay River. This is a long Fjord, over 400 feet deep in places. 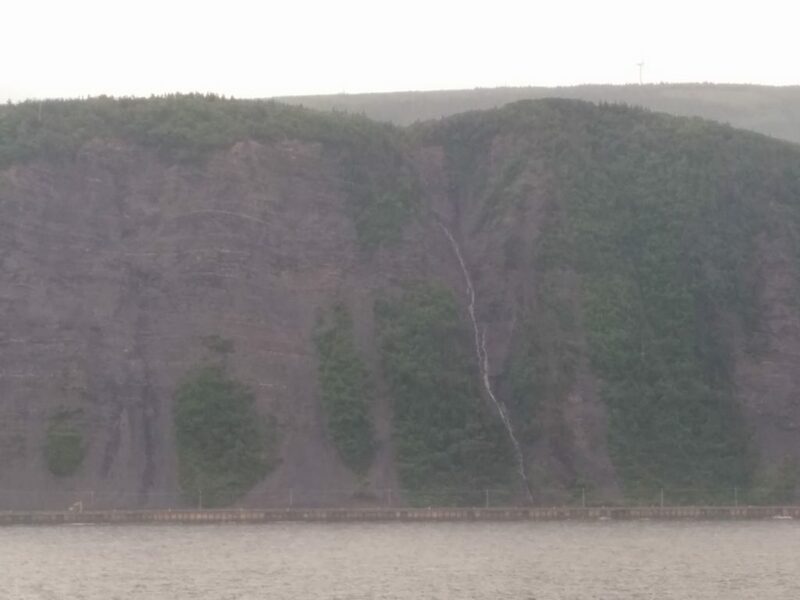 Where the strong current (up to 9 knots) of the Saguenay enters the St. Lawrence, navigation can be challenging. But we’d timed the current correctly, and the wind was coming from the right direction, so getting to the marina wasn’t difficult. This area is home to up to 7 species of whales. 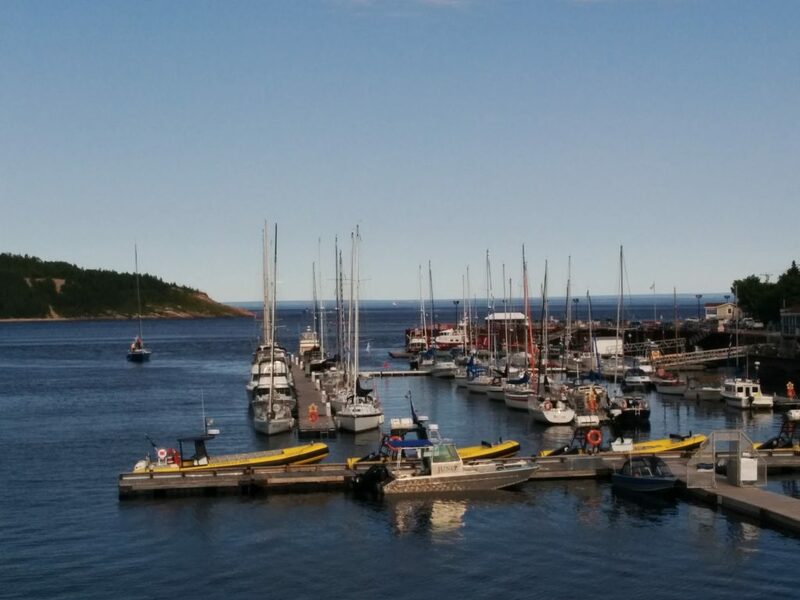 We saw two groups of belugas on our way here, and whale-watching cruises leave Tadoussac almost constantly. The currents of the two rivers bring up nutrients from the deep, cold waters which form the base of an exceptionally productive food chain, with the whales on top. We measured water temperatures in the low 50s on our approach. The section of the St. Lawrence between Quebec City and Toudoussac is called the Charlevoix Region. The scenery is spectacular, and the scale of the landscape enormous. 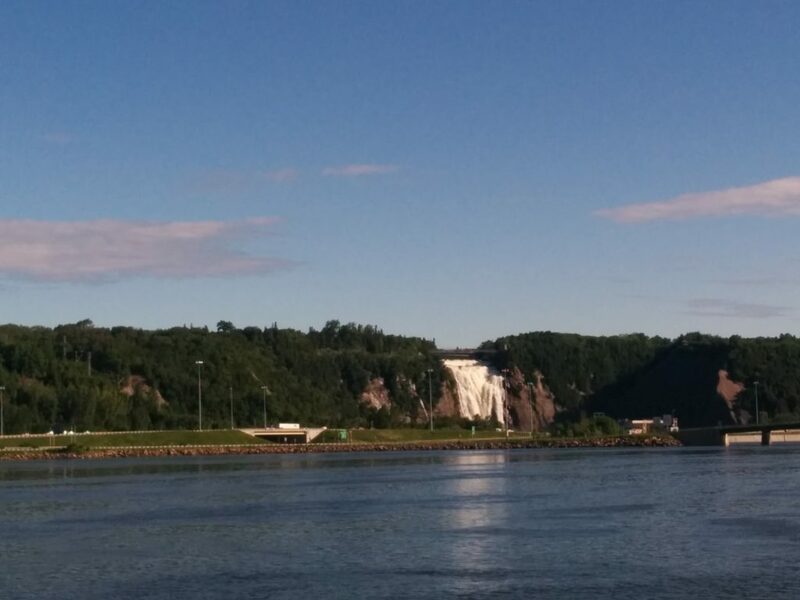 Our first landmark after leaving Quebec City on the North Channel was Chute-Montmorency, or Montmorency Falls, which are higher than Niagara Falls. For the first night out from Quebec, there’s really only one overnight option for transient boaters, Cap-à-l’Aigle (Cape Eagle), pronounced Cahp-ah-lay, with just the hint of a “g” at the end. Getting there requires careful timing to run the 72 miles with the maximum benefit from the strong tidal currents. 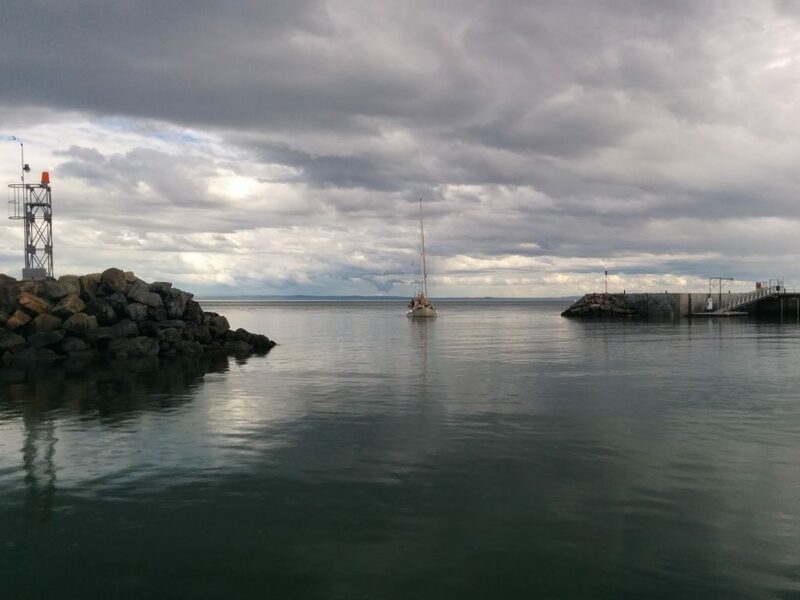 Ports like Cap-à-l’Aigle are “Harbors of Refuge” created by the Canadian federal government. They surround a basin with a stone breakwater to create an artificial harbor protected from the winds and waves of the river or ocean. 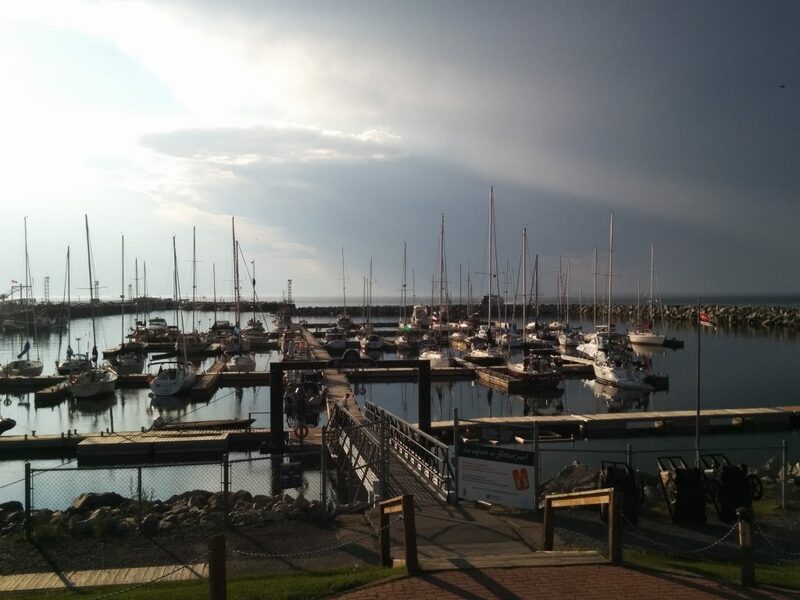 Although initially developed for commercial use, many have been updated with floating docks and other facilities for recreational boaters, and are operated just like any other marina. 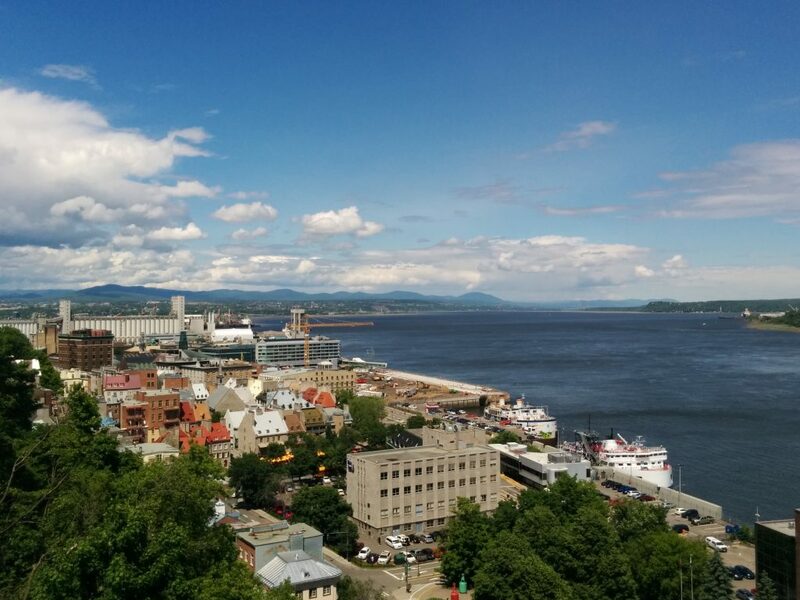 We extended our stay in Quebec City another night, and spent the day on various boat chores. We topped off our fuel and water tanks and pumped out our waste tanks. We stocked up on supplies at the Metro supermarket nearby and the indoor farmer’s market right across from the marina. We also met up with André, a friendly local with 35 years of boating experience in the St. Lawrence and a member of the Canadian Auxiliary Coastguard. He was kind enough to share some advice in the cockpit of Bear Keeper, another boat which will be leaving here tomorrow and following the same route to Maine. In addition to his invaluable local knowledge, his native French, along with personal connections at every port, has already paid off. We called the only marina that’s a viable option for tomorrow night and reached someone who spoke no English. No problem, it turned out to be someone André knew well, and we passed him the phone. In between chatting and catching up (in French), André was able to secure reservations for both boats for tomorrow. He also assured us that, no matter what port we’re in, even if the staff speaks no English there will be a friendly English-speaking local like him who would love to help out. 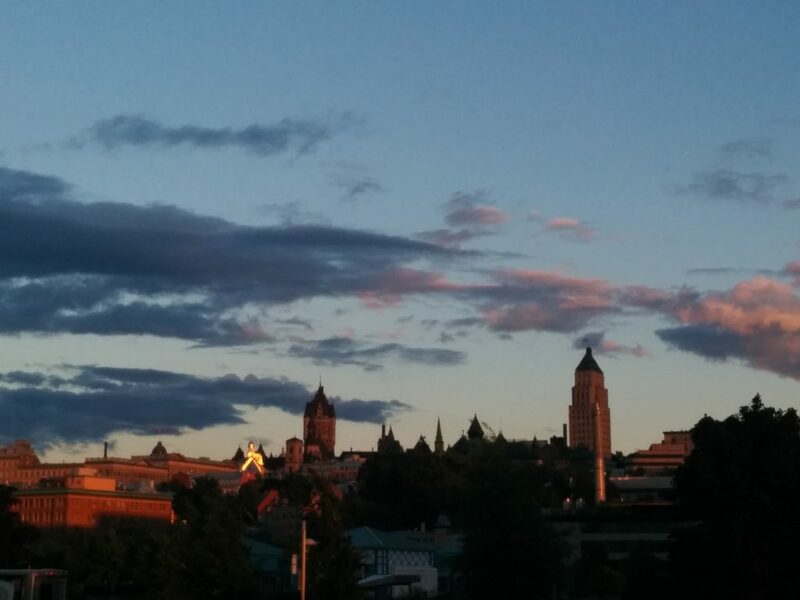 As the last rays of the sun hit the old city, we had a dinner of local sausage from the farmer’s market, washed down with a bottle of local hard cider. 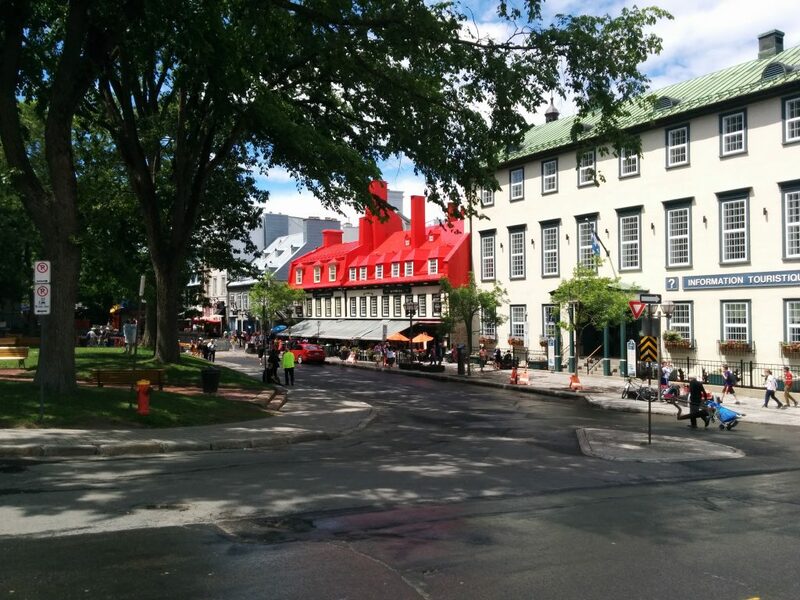 It’s hard to describe Quebec City in the few words I’ve been posting here. 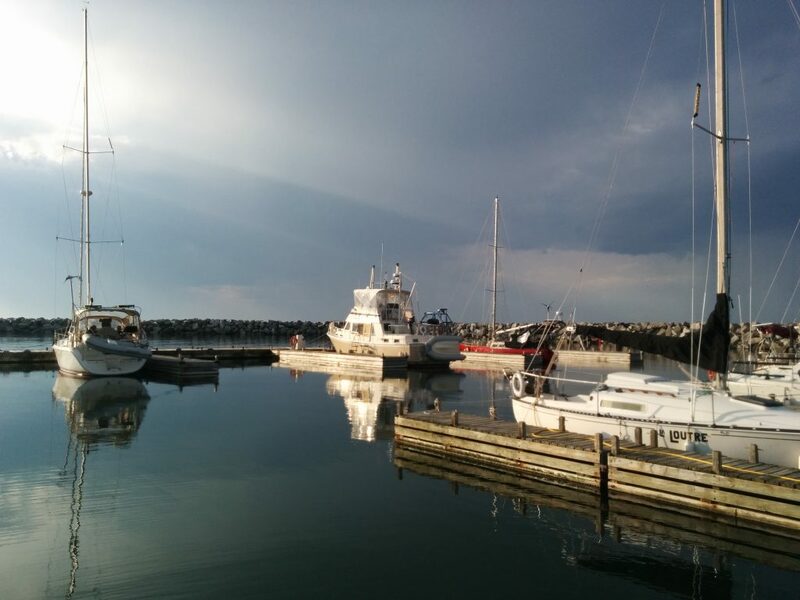 The marina is modern and well maintained. It’s tucked into a very industrial section of waterfront. But just steps away is the cobbled street leading up to the old, walled city. The arcitecture is impressive. 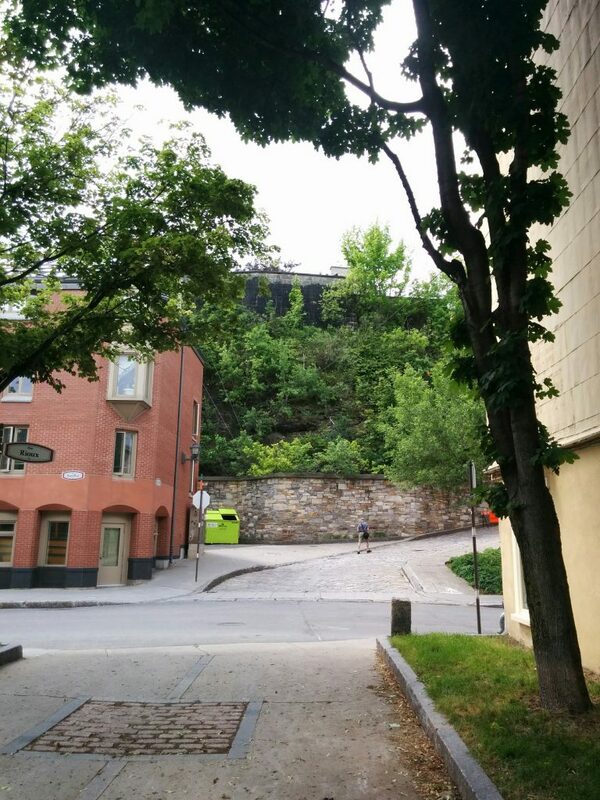 Quebec City does have high-rise office towers and apartment buildings, but in the old city, massive stone structures, hundreds of years old, dominate. Along with all the stone buildings are colorful roofs, open plazas and wide sidewalks with open-air cafes. 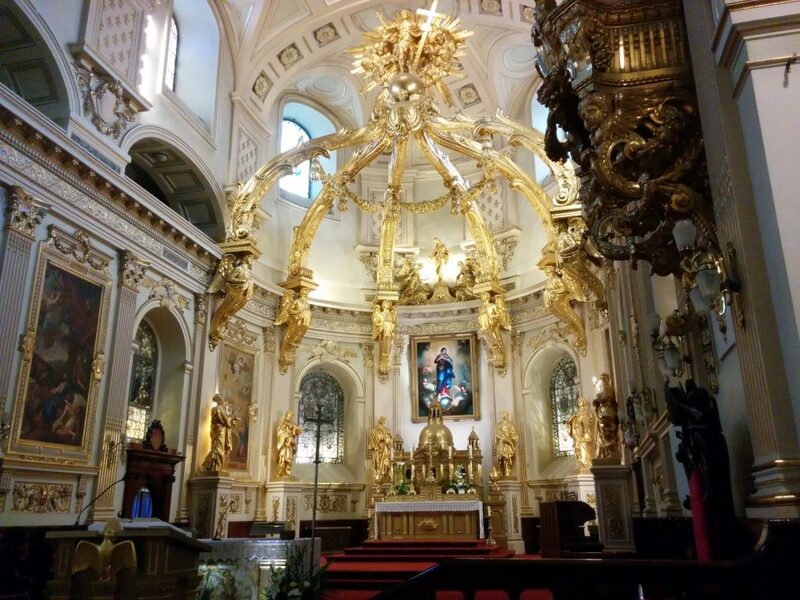 The Cathedral-Basilica of Notre-Dame de Québec is an impressive sight, and the interior is breathtaking. 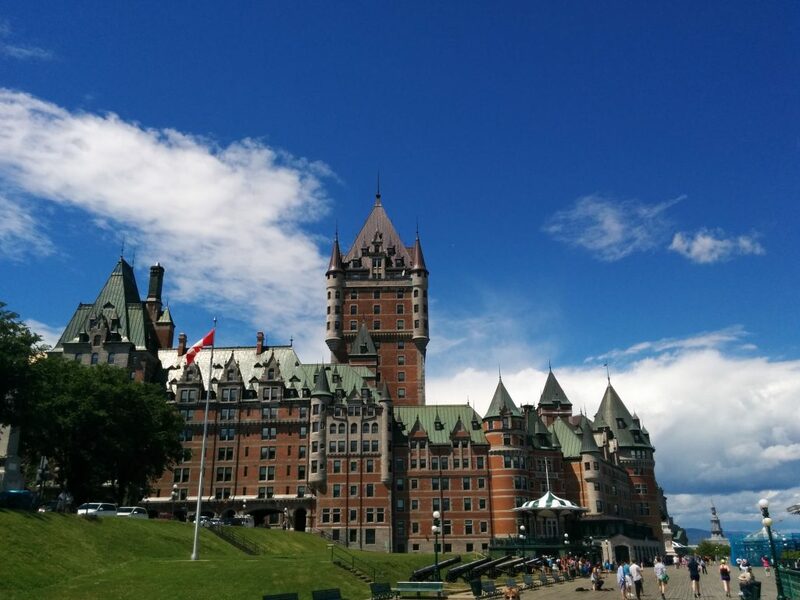 Dominating the walled city is Le Château Frontenac, a luxury hotel built in 1892-3. 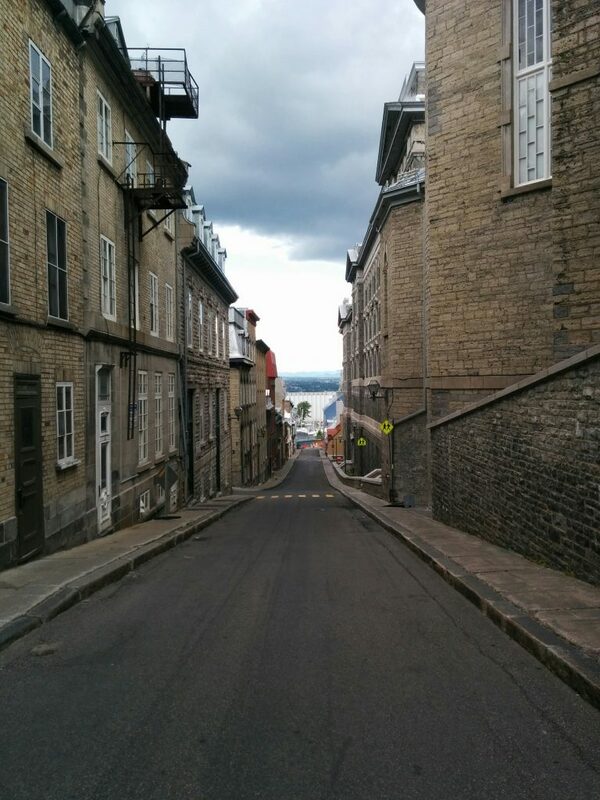 Around and above the Frontenac is a wide prominade with several flights of stairs leading up to the base of the Citadelle de Québec, still an active military base and official residence of both the Canadian monarch and the Governor General of Canada. It’s easy to see why this site was chosen for a fort to control access up the St. Lawerence River. 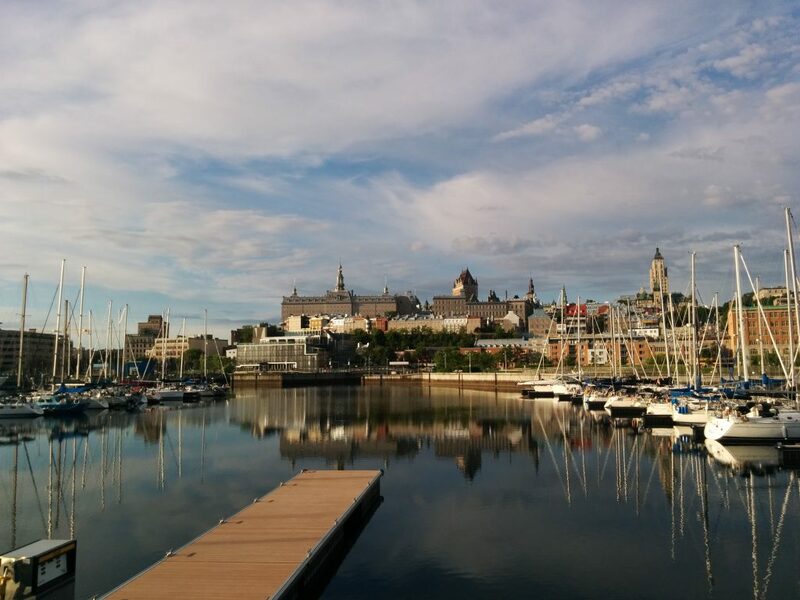 At the end of a long day of taking in the sights of Old Quebec City, it was good to get back to the marina for some R&R.